Al Gore is a United States politician and environmentalist. He is the former Vice President of the United States (1993–2001), the 2000 Democratic Party presidential nominee, and the co-recipient of the 2007 Nobel Peace Prize with the Intergovernmental Panel on Climate Change. He has been involved with the environmental activist movement for a number of decades, and has had full participation since he left the vice-presidency in 2001. As I was entering high school, my mother was reading Silent Spring and the dinner table conversation was about pesticides and the environment ... The year I graduated from college the momentum was building for Earth Day. After Vietnam, as I was entering divinity school, the Club of Rome report came out and the limits to growth was a main issue. Gore has been involved with the environment for a number of decades. In 1976, at 28, after joining the United States House of Representatives, Gore held the "first congressional hearings on the climate change, and co-sponsor[ed] hearings on toxic waste and global warming." He continued to speak on the topic throughout the 1980s and was known as one of the Atari Democrats, later called the "Democrats' Greens, politicians who see issues like clean air, clean water and global warming as the key to future victories for their party." Humankind has suddenly entered into a brand new relationship with the planet Earth. The world's forests are being destroyed; an enormous hole is opening in the ozone layer. Living species are dying at an unprecedented rate. The Concord Monitor says that Gore "was one of the first politicians to grasp the seriousness of climate change and to call for a reduction in emissions of carbon dioxide and other greenhouse gases. As Vice President, Gore was involved in a number of initiatives related to the environment. He launched the GLOBE program on Earth Day 1994, an education and science activity that, according to Forbes, "made extensive use of the Internet to increase student awareness of their environment". In the late 1990s, Gore strongly pushed for the passage of the Kyoto Protocol, which called for reduction in greenhouse gas emissions. He was opposed by the Senate, which passed unanimously (95–0) the Byrd–Hagel Resolution (S. Res. 98), which stated the sense of the Senate was that the United States should not be a signatory to any protocol that did not include binding targets and timetables for developing as well as industrialized nations or "would result in serious harm to the economy of the United States". On November 12, 1998, Gore symbolically signed the protocol. Both Gore and Senator Joseph Lieberman indicated that the protocol would not be acted upon in the Senate until there was participation by the developing nations. The Clinton Administration never submitted the protocol to the Senate for ratification. In 1998, Gore became associated with Digital Earth.. He also began promoting a NASA satellite that would provide a constant view of Earth, marking the first time such an image would have been made since The Blue Marble photo from the 1972 Apollo 17 mission. The "Triana" satellite would have been permanently mounted in the L1 Lagrangian Point, 1.5 million km away. This satellite would allow the measurement of the earth's changing reflectivity (albedo) due to melting ice caps, but the project was put on hold by George W. Bush's administration. The satellite was finally launched in 2015 as the Deep Space Climate Observatory. In 2004, Gore co-launched Generation Investment Management, a company for which he serves as Chair. The company was "a new London fund management firm that plans to create environment-friendly portfolios. Generation Investment will manage assets of institutional investors, such as pension funds, foundations and endowments, as well as those of 'high net worth individuals,' from offices in London and Washington, D.C." The fund's filed accounts showed profits in 2017 of £248.5m, with assets of £14.2bn. Turnover at the London-based operation was £293m with distributed profits of £193m to the firm's 32 members, one of the senior staff receiving £41m (Sunday Times (UK), 16 September 2018). Gore and The Alliance for Climate Protection created the We Can Solve It organization, a web-based program with multiple advertisements on television focused on spreading awareness for climate crisis (global warming) and petitioning for the press putting more attention on the crisis, the government doing more to help the environment, and their ultimate goal is the end to global warming. Although focused mostly upon the United States, and Americans, it is an international petition and effort. It already has over one million signatures. In recent years, Gore has remained busy traveling the world speaking and participating in events mainly aimed towards global warming awareness and prevention. His keynote presentation on global warming has received standing ovations, and he has presented it at least 1,000 times according to his monologue in An Inconvenient Truth. His speaking fee is $100,000. Gore's global warming presentations in several major cities have sometimes been associated with exceptionally severe cold weather, a juxtaposition since dubbed "the Gore Effect." Gore is a vocal proponent of carbon neutrality, buying a carbon offset each time he travels by aircraft. Gore and his family drive hybrid vehicles. In An Inconvenient Truth Gore calls for people to conserve energy. In 2007, Al Gore was the main non-official representative for the United States in the United Nations Climate Change Conference in Bali, which is a series of discussions that plans to continue where the Kyoto Protocol left off when it expires in 2012. He used a famous World War II poem written by Pastor Martin Niemöller to describe how the international community is eerily accomplishing nothing in the face of the greatest crisis in human history. He ended the speech using his famous tag line: "However, political will is a renewable resource." A public lecture at University of Toronto on February 21, 2007, on the topic of global warming, led to a crash of the ticket sales website within minutes of opening. In March 2008, Gore gave a talk via videoconferencing in order to promote this technology as a means, he argued, of fighting global warming. On July 21, 2008, Al Gore used a speech to challenge the United States to commit to producing all electricity from renewable sources (AERS) like solar and wind power in 10 years . Al Gore´s Alliance for Climate Protection In this speech, Al Gore says that our dangerous over-reliance on carbon-based fuels is at the core of all three of the economic, environmental and national security crises. Our democracy has become sclerotic at a time when these crises require bold policy solutions. Center for Resource Solutions supports Al Gore's Repower America goal. In March 2010 two nonprofit organizations founded by Al Gore, The Alliance for Climate Protection and The Climate Project, joined together, and in July 2011 the combined organization was renamed the Climate Reality Project. In February 2012 the Climate Reality Project organized an expedition to the Antarctic with civic and business leaders, activists and concerned citizens from many countries. In 2013, Gore became a vegan. He had earlier said that "it's absolutely correct that the growing meat intensity of diets across the world is one of the issues connected to this global crisis -- not only because of the [carbon dioxide] involved, but also because of the water consumed in the process" and some speculate that his adoption of the new diet is related to his environmentalist stance. In a 2014 interview, Gore said "Over a year ago I changed my diet to a vegan diet, really just to experiment to see what it was like. ... I felt better, so I've continued with it and I'm likely to continue it for the rest of my life." In a plenary session of the 47th annual meeting of the World Economic Forum (WEF) in Davos of Switzerland on January 18, 2017, Al Gore urged Prime Minister of Bangladesh Sheikh Hasina to stop building the coal-powered Rampal Power Station close to the largest mangrove forest, Sundarbans. Four main environmental criticisms have been leveled at Gore: (1) he has an alleged conflict of interest from his role as both an investor in green-technology companies and as an advocate of taxpayer-funded green-technology subsidies, (2) he allegedly makes erroneous scientific claims, (3) he consumes excessive amounts of energy, and (4) he allegedly refuses to debate others on the subject of global warming. In reference to Gore's alleged conflict of interest, some critics have labeled Gore a "carbon billionaire." In response to these criticisms Gore stated that it is "certainly not true" that he is a "carbon billionaire" and that he is "proud to put my money where my mouth is for the past 30 years. And though that is not the majority of my business activities, I absolutely believe in investing in accordance with my beliefs and my values." Gore was challenged on this topic by Tennessee Congresswoman Marsha Blackburn who asked him: "The legislation that we are discussing here today, is that something that you are going to personally benefit from?" Gore responded by stating: "I believe that the transition to a green economy is good for our economy and good for all of us, and I have invested in it." Gore also added that all earnings from his investments have gone to the Alliance for Climate Protection and that "If you believe that the reason I have been working on this issue for 30 years is because of greed, you don't know me." Finally, Gore told Blackburn: "Do you think there is something wrong with being active in business in this country ... I am proud of it. I am proud of it." Criticisms of Gore's allegedly erroneous scientific statements tend to focus on a British High Court's ruling that Gore's Inconvenient Truth documentary was deemed by the court to have nine significant errors. Several of these, such as the statement that climate change was a main cause of coral reef bleaching, and that polar bears were drowning due to habitat-loss as a result of ice-cap melting, have been subsequently backed up by stronger evidence than the court was able to locate at the time. The court's broad conclusion, nevertheless, was that "many of the claims made by the film were fully backed up by the weight of science." Gore has also been the subject of criticism for his personal use of energy, including his ownership of multiple large homes. The Tennessee Center for Policy Research (TCPR) has twice criticized Gore for electricity consumption in his Tennessee home. In February 2007, TCPR stated that its analysis of records from the Nashville Electric Service indicated that the Gore household uses "20 times as much electricity as the average household nationwide." In reporting on TCPR's claims, MSNBC's Countdown With Keith Olbermann noted that the house has twenty rooms and home offices and that the "green power switch" installed increased their electric bill while decreasing overall carbon pollution. Philosopher A. C. Grayling also defended Al Gore, arguing that Gore's personal lifestyle does nothing to impugn his message and that Gore's critics have committed the ad hominem fallacy. A few months later, the Associated Press reported on December 13, 2007, that Gore "has completed a host of improvements to make the home more energy efficient, and a building-industry group has praised the house as one of the nation's most environmentally friendly ... 'Short of tearing it down and starting anew, I don't know how it could have been rated any higher,' said Kim Shinn of the non-profit U.S. Green Building Council, which gave the house its second-highest rating for sustainable design." Gore was criticized by the TCPR again in June 2008, after the group obtained his public utility bills from the Nashville Electric Service and compared "electricity consumption between the 12 months before June 2007, when it says he installed his new technology, and the year since then." According to their analysis, the Gores consumed 10% more energy in the year since their home received its eco-friendly modifications. TCPR also argued that, while the "average American household consumes 11,040 kWh in an entire year," the Gore residence "uses an average of 17,768 kWh per month –1,638 kWh more energy per month than before the renovations." Gore's spokeswoman Kalee Kreider countered the claim by stating that the Gores' "utility bills have gone down 40 percent since the green retrofit." and that "the three-year renovation on the home wasn't complete until November, so it's a bit early to attempt a before-and-after comparison." She also noted that TCPR did not include Gore's gas bill in their analysis (which they had done the previous year) and that the gas "bill has gone down 90 percent ... And when the Gores do power up, they pay for renewable resources, like wind and solar power or methane gas." Media Matters for America also discussed the fact that "100 percent of the electricity in his home comes from green power" and quoted the Tennessee Valley Authority as stating that "[a]lthough no source of energy is impact-free, renewable resources create less waste and pollution." 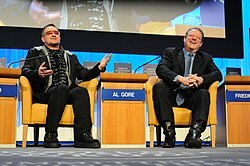 Gore starred in the documentary film An Inconvenient Truth, released on May 24, 2006. The film documents the evidence for anthropogenic global warming and warns of the consequences of people not making immediate changes to their behavior. It is the fourth-highest-grossing documentary in U.S. history. After An Inconvenient Truth was nominated for an Academy Award, Donna Brazile (Gore's campaign chairwoman from the 2000 campaign) speculated that Gore might announce a possible presidential candidacy for the 2008 election. During a speech on January 31, 2007, at Moravian College, Brazile stated, "Wait till Oscar night, I tell people: 'I'm dating. I haven't fallen in love yet. On Oscar night, if Al Gore has slimmed down 25 or 30 pounds, Lord knows.'" During the award ceremony, Gore and actor Leonardo DiCaprio shared the stage to speak about the "greening" of the ceremony itself. Gore began to give a speech that appeared to be leading up to an announcement that he would run for president. However, background music drowned him out and he was escorted offstage, implying that it was a rehearsed gag, which he later acknowledged. After winning the 2007 Academy Award for Documentary Feature. the Oscar was awarded to director Davis Guggenheim, who asked Gore to join him and other members of the crew on stage. Gore then gave a brief speech, saying, "My fellow Americans, people all over the world, we need to solve the climate crisis. It's not a political issue; it's a moral issue. We have everything we need to get started, with the possible exception of the will to act. That's a renewable resource. Let's renew it." At the 2017 Sundance Film Festival, Gore released An Inconvenient Sequel: Truth to Power, a sequel to his 2006 film, An Inconvenient Truth, which documents his continuing efforts to battle climate change. Gore wrote Earth in the Balance (which was published in 1992) while his six-year-old son Albert was recovering from a serious accident. It became the first book written by a sitting Senator to make The New York Times bestseller list since John F. Kennedy's Profiles in Courage. Gore also published the book An Inconvenient Truth: The Planetary Emergency of Global Warming and What We Can Do About It, which became a bestseller. In reference to the use of nuclear power to mitigate global warming, Gore has stated, "Nuclear energy is not the panacea for tackling global warming." In July 2017, Gore published An Inconvenient Sequel: Truth to Power: Your Action Handbook to Learn the Science, Find Your Voice, and Help Solve the Climate Crisis, concurrent with his film An Inconvenient Sequel: Truth to Power. Gore's head in a jar as depicted in the Futurama episode "Crimes of the Hot". Gore appeared in Matt Groening's Futurama as himself and his own head in a jar in episodes related to environmentalism. Gore also reprised the role in the 2007 film, Futurama: Bender's Big Score. In 2000 Gore had offered to appear in the 2000 season finale of Futurama, "Anthology of Interest I". In this episode, Gore led his team of "Vice Presidential Action Rangers" in their goal to protect the space-time continuum. In 2002, Gore appeared in the episode "Crimes of the Hot". In addition, Gore used a short clip from Futurama to explain how global warming works in his presentations as well as in An Inconvenient Truth. An internet promo for An Inconvenient Truth titled A Terrifying Message From Al Gore was also produced by Groening and David X. Cohen, creators of Futurama, starring Gore and Bender (John DiMaggio). On July 7, 2007, Live Earth benefit concerts were held around the world in an effort to raise awareness about climate change. The event was the brainchild of Gore and Kevin Wall of Save Our Selves. On July 21, 2007, Gore announced he was teaming with actress Cameron Diaz for a TV climate contest, 60 Seconds to Save the Earth, to gain people's support in solving the climate crisis. Gore was awarded the 2007 Nobel Peace Prize, which was shared by the Intergovernmental Panel on Climate Change, headed by Rajendra K. Pachauri (Delhi, India). The award was given "for their efforts to build up and disseminate greater knowledge about man-made climate change, and to lay the foundations for the measures that are needed to counteract such change" on October 12, 2007. I am deeply honored to receive the Nobel Peace Prize. This award is even more meaningful because I have the honor of sharing it with the Intergovernmental Panel on Climate Change—the world's pre-eminent scientific body devoted to improving our understanding of the climate crisis—a group whose members have worked tirelessly and selflessly for many years. We face a true planetary emergency. The climate crisis is not a political issue, it is a moral and spiritual challenge to all of humanity. It is also our greatest opportunity to lift global consciousness to a higher level. Gore and Pachauri accepted the Nobel Peace Prize for 2007 in Oslo, Norway on December 10, 2007. In a talk given during March 2008 in Delhi, Gore argued that India, as a leader in information technology, is in a particularly strong position to also lead the way in climate change. This talk coincided with the release of two children's books by Gore jointly published with the India Habitat Centre. 2008 Dan David Prize: "Social Responsibility with Particular Emphasis on the Environment." 2008 The Gore resolution (HJR712) passed by the Tennessee House of Representatives which honors Gore's "efforts to curb global warming." Al Gore (2008). Our Purpose: The Nobel Peace Prize Lecture 2007. Rodale Books. ISBN 978-1-60529-990-7. Al Gore (2006). An Inconvenient Truth: The Planetary Emergency of Global Warming and What We can do about it. New York: Rodale Books. ISBN 978-1-59486-567-1. Al Gore (1992). Earth in the Balance: Forging a New Common Purpose. Earthscan. ISBN 978-0-618-05664-4. "We Can’t Wish Away Climate Change." The New York Times, February 27, 2010. "The Climate for Change." The New York Times, 9 November 2008. The Digital Earth: Understanding our planet in the 21st Century, by Vice President Al Gore, Given at the California Science Center, Los Angeles, California, on January 31, 1998. "Understanding Earth: Retrospectives and Visions post conferences report." GeoJournal, Volume 37, Number 3 / November 1995. The Climate Change Action Plan. Washington, D.C.: The White House, October 1993 (with William Clinton). Gore Jr, A (1992). "We must challenge the unthinkable". Integration (Tokyo, Japan) (31): 18–23. PMID 12284961. "Gaining our eco-librium." Forum for Applied Research and Public Policy ; Vol/Issue: 5:2, June 1, 1990. "To Skeptics on Global Warming . . .." The New York Times, April 22, 1990. Climate crisis (global warming/climate change). Energy tsunami (a loss of access to foreign oil). ^ a b DIONNE, E. J. (June 14, 1989). "Greening of Democrats: An 80's Mix of Idealism And Shrewd Politics". The New York Times. Retrieved 2008-06-28. ^ Aldred, Jessica (October 12, 2007). "Timeline: Al Gore". London: The Guardian. Retrieved 2008-06-18. ^ Corn, David (May 25, 2006). "Timeline: Al Gore". The Nation. Retrieved 2008-06-28. ^ Walsh, Bryan (October 12, 2007). "A Green Tipping Point". TIME. Retrieved 2008-06-28. ^ "Albert A. Gore, Jr., 45th Vice President (1993–2001)". senate.gov. Retrieved 2008-06-22. ^ PHILIP SHABECOFF (3 May 1990). "World's Legislators Urge 'Marshall Plan' For the Environment". The New York Times. Retrieved 2008-03-10. ^ Monitor staff (27 February 2007). "Oscar win was one more first for Al Gore". Monitor editorial. Concord Monitor. Retrieved 2007-05-29. ^ "Gore really does get the web". Forbes. September 21, 2006. ^ "Remarks By Al Gore, Climate Change Conference". Archived from the original on 2000-12-07. Retrieved 2006-09-01. ^ "Vice President Gore: Strong Environmental Leadership for the New Millennium". Retrieved 2006-09-01. ^ "U.S. Senate Roll Call Votes 105th Congress — 1st Session:S.Res. 98". 1997-07-25. Retrieved 2007-01-31. ^ "Text of the Byrd–Hagel Resolution". 1997-07-25. Archived from the original on 2006-11-02. Retrieved 2006-11-05. ^ "Business Today". St. Petersburg Times. 10 Nov 2004. Retrieved 2008-06-18. ^ Al Gore - speech at ENBW Part 2 (internet video). Archived from the original on 2008-01-31. ^ Andrew Bolt (November 17, 2006). "Al Gore rains on his party". Herald Sun. ^ Michael Daly (December 20, 2009). "The Gore Effect brings snow to New York City". NY Daily News. ^ Freedland, Jonathan (2006-05-31). "Born Again". London: Guardian Unlimited. Retrieved 2010-03-30. ^ "Larry King Live — Interview with Al Gore". CNN. 2006-06-13. ^ "UN Climate Convention in Bali". Science Daily. 2007-12-17. Retrieved 2008-01-10. ^ "Al Gore's Speech in Bali". 2007-12-13. Archived from the original on 2007-12-19. Retrieved 2008-01-08. ^ "Committee on Foreign Affairs". 2007-12-13. Archived from the original on 2008-01-09. Retrieved 2008-01-08. ^ Virgin Earth Challenge official web site. Al Gore is listed as a judge. ^ "An Inconvenient Rush: Thousands out of luck as Gore talk sells out in minutes". Toronto Star. February 8, 2007. ^ "Al Gore: A Generational Challenge to Repower America (full text and video)". We Campaign. 2008-07-17. Archived from the original on November 21, 2008. Retrieved 2008-07-18. ^ Stout, David (2008-07-18). "Gore Calls for Carbon-Free Electric Power". The New York Times. Retrieved 2008-07-18. ^ "Gore challenges US to ditch oil". BBC. 2008-07-18. Retrieved 2008-07-18. ^ "Center for Resource Solutions Supports Al Gore's 100% Renewable Energy Goal". Archived from the original on 2009-01-05. Retrieved 2008-09-27. ^ "Gore urges civil disobedience to stop coal plants". Reuters. 2008-09-24. ^ Kristof, Nicholas D. (2007-08-16). "The Big Melt". The New York Times. ^ Geman, Ben. "Gore-backed climate groups form single organization" Archived 2013-10-30 at the Wayback Machine. The Hill, March 5, 2010. ^ Roberts, David. "Gore launches new Climate Reality Project, tells Grist all about it". Grist," March 25, 2010. ^ Johnson, Brad. "Living On Thin Ice: Al Gore To Discuss Climate Reality In Antarctica". Think Progress, January 26, 2012. ^ "Stop building Rampal Power Plant so close to Sundarban: Al Gore to Sheikh Hasina | Foreign Relations | ABnews24". abnews24.com/english. Retrieved 2017-01-28. ^ Pilkington, Ed (2009-11-03). "Al Gore's green investments prompt conflict of interest row". The Guardian. London. Retrieved 2010-03-30. ^ "Obama "Bailing Out" Al Gore and Utilities". National Center for Public Policy Research. 2009-11-03. Retrieved 2009-11-05. ^ a b c Smith, Lewis (2007-10-11). "Al Gores inconvenient judgment". The Times. London. Retrieved 2010-03-30. ^ Usborne, David (2009-11-04). "Al Gore denies he is 'carbon billionaire'". London: The Independent. Retrieved 2009-11-05. ^ a b c Allen, Nick (2009-11-03). "Al Gore 'profiting' from climate change agenda". London: The Telegraph. Retrieved 2009-11-05. ^ Broder, John M. (2009-11-02). "Gore's Dual Role: Advocate and Investor". The New York Times. Retrieved 2009-11-05. ^ "International Union for the Conservation of Nature". Retrieved 2019-02-15. ^ "Polar Bears Really Are Starving Because of Global Warming, Study Shows". National Geographic. Retrieved 2019-02-15. ^ "Indisputable: Gore buys Montecito villa". The Los Angeles Times. 2010-05-08. ^ "Al Gore's Personal Energy Use Is His Own "Inconvenient Truth"". TCPR. February 26, 2007. Archived from the original on October 13, 2007. Retrieved 2008-07-18. ^ Chris Cillizza & Matthew Mosk (March 1, 2007). "War on Warming Begins at (Al Gore's) Home". The Washington Post. Retrieved 2008-07-18. ^ Countdown With Keith Olbermann, MSNBC. February 27, 2007 broadcast. ^ Grayling, A. C. (March 4, 2007). "Good men in a mad, bad world". London: The Independent. Archived from the original on May 15, 2011. ^ "Al Gore's Personal Electricity Consumption Up 10% Despite "Energy-Efficient" Renovations". TCPR. June 23, 2008. Archived from the original on 2008-06-18. Retrieved 2008-07-18. ^ a b Leonard, Tom (2008-06-18). "Al Gore's electricity bill goes through the (insulated) roof". London: The Daily Telegraph. Retrieved 2008-06-19. ^ "Hume claimed Gore's "energy use has surged more than 10 percent," ignored Gore's response that it's all "green power"". Media Matters for America. 2008-06-19. Retrieved 2008-06-19. ^ Johnson, Keith (2009-05-05). "A Heated Exchange: Al Gore Confronts His Critic(s)". The Wall Street Journal. Retrieved 2009-12-20. ^ "DOCUMENTARY: 1982–Present". Box Office Mojo. (Rankings). ^ Frei, Matt (2007-02-28). "Washington diary: Al meets Oscar". BBC News. Retrieved 2008-01-03. ^ "Will Al's Oscar Bounce Put Him in the Race?". ABC News. 2007-02-26. Retrieved 2008-02-04. ^ Jim Malone (2007-02-27). "Gore's Oscar Win Prompts New Political Speculation". Voice of America. Archived from the original on 2007-04-11. Retrieved 2008-02-03. ^ "79th Annual Academy Awards". OSCAR.com. Archived from the original on 2007-07-01. Retrieved 2007-05-24. ^ "Gore Wins Hollywood in a Landslide"
^ Zulkey, Jack (June 7, 2007). "Al Gore, The Futurama President". Huffington Post. Retrieved 2007-06-08. ^ Associated Press (May 22, 2000). "Veep guest stars in TV cartoon". USA Today. Retrieved 2007-06-06. ^ Associated Press (November 8, 2002). "Al Gore reprises role on 'Futurama' cartoon". Archived from the original on October 11, 2007. Retrieved 2007-06-06. ^ Clarke, Donald (September 15, 2006). "You Go, Gore". Irish Times. Retrieved 2007-06-06. ^ David X. Cohen, Al Gore and Matt Groening (2007). Futurama:Bender's Big Score DVD commentary for "A Terrifying Message From Al Gore" (DVD). 20th Century Fox. ^ ""Live Earth" Concerts in All 7 Continents to Reach Global Audience of Over 2 Billion". ^ BBC (2007-10-12). "Indian's surprise at Nobel award". BBC. ^ "Peace 2007". Nobel Foundation. Retrieved 2007-10-12. ^ Al Gore (2007-10-12). "I am deeply honored". Al Gore. Archived from the original on 2008-03-03. ^ Al Gore (2007-12-10). "Nobel Prize Acceptance Speech, December 10, 2007". Al Gore. Archived from the original on 2010-12-05. ^ Al Gore Nobel Lecture, Oslo, 10 December 2007. ^ "Al Gore and Amos Oz Among 2008 Dan David Prize Winners". February 12, 2008. ^ "House passes resolution to honor Gore's efforts". knoxnews.com. Retrieved 2008-01-11. ^ "Al Gore To Be Awarded Gothenburg Prize For Sustainability". SR International - Radio Sweden. Archived from the original on 2008-01-19. Retrieved 2008-01-06. ^ "Al Gore". Prince of Asturias Foundation. Archived from the original on 2007-09-26. Retrieved 2007-07-17. ^ Lisa Knox Burns. "Gore to People: It's Up to US" Archived 2008-04-05 at the Wayback Machine edhat.com.